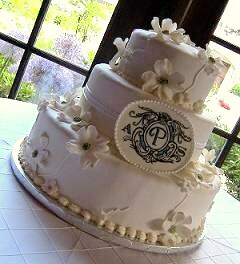 Flowers around a monogram topper? 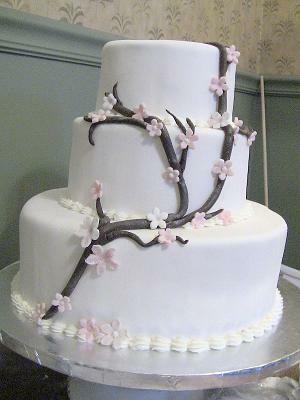 I want to put silk flowers on our wedding cake. We have a crystal monogrammed topper and I don't know if we should put flowers around it or leave it just the topper only. I prefer flowers to soften it a little. I would suggest trying the flowers and if you don't like it you can remove them easily enough. All of your cakes come out beautiful. I would like to learn how to make flowers to put on my cakes. Do you have videos on how to make fondant flowers? Do you make all of your flowers or are they natural? 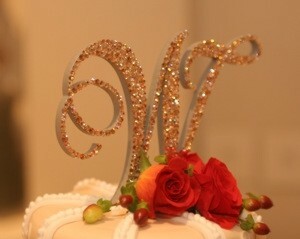 Thank you :-) Some of my wedding cakes have fresh flowers and some have fondant or gum paste. I make them myself. I do have a tutorial on making fondant roses. I am about to make a new video on Dogwood flowers and a few others. 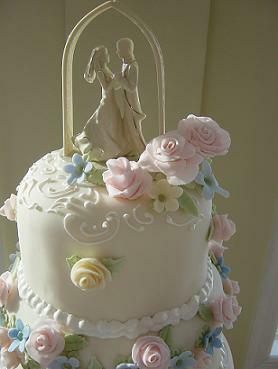 Join my Wedding Cakes For You Youtube channel and you will be updated when I add new videos. You can also see the How to make a fondant rose on this site as well. Thanks for visiting and asking a great question about flowers on wedding cakes. I am making my daughters wedding cake and she wants fresh flowers on it. I was told not to place the flowers directly into the cake because the flowers from the florist have been sprayed with pesticides. It seems like most all cakes that are decorated with flowers are directly stuck into the cake. Do you have any ideas how I can do this without having to use an oasis and worrying about the water in the oasis leaking on the cake. 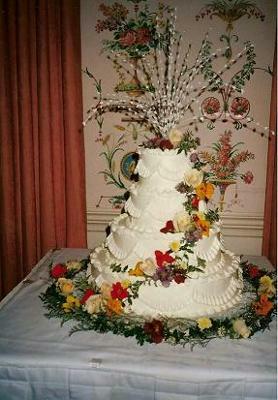 I have been decorating wedding cakes with fresh flowers for years and have never been concerned about that. Most of the time I place the flowers on the cake (as in the cake shown above)But on occasion I have pushed a stem or two into the cake. 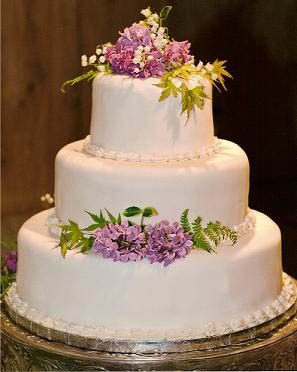 I also recommend and have used an oasis for flower arrangements on the top of the cake. You can get them at floral or craft shops. You just push the flower stems in and they stay nice and fresh for a couple of days. If you are concerned you could rinse off the flowers first, or use individual little vases, which they have at most florist shops. tell you which flowers are edible. If any one reading this has other ideas please feel free to add your suggestions. I would use flower picks - these are tiny plastic pipes that you stick into the cake and then put your flowers in. You can't add water to them so they are not vases as such, but really just prevent the actually flower stem from having contact with the cake.